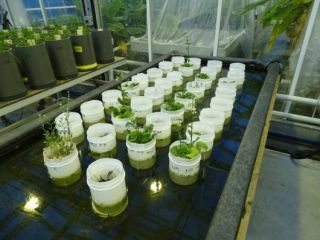 An experiment that resulted in various flowering plants, especially in a Mars soil simulant. The pots were put in water to keep the soil containing the earthworms cool. Illustration of potential appearance of a closed agricultural ecosystem on Mars. Simulated "Martian gardens" allow NASA scientists to test which plants can be grown on Mars. This photo shows the results of a preliminary study on lettuce. From left to right: lettuce seeds grown in potting soil, the Martian simulant with added nutrients, and the simulant without nutrients.